It is rightly said that an image is worth thousand words. Even if you have wonderful images in your blog post or a website, it does not get picked up by search engines easily. The filename goes a long way in getting images indexed by search engines. Always use human readable file-names like apple.jpg if the image is of an apple. Think of keywords what users are going to type in a search engine, before giving a name to the file. Give a filename to such images like prodigal_son_rembrandt.jpg. Multiple keywords in image names should be separated by an underscore( _ ). 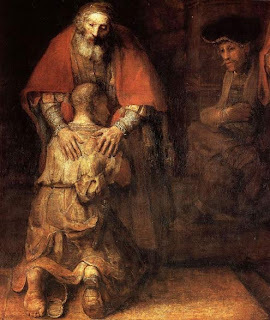 As a result your image will now appear in the search results if the user types queries like 'Rembrandt' or 'Prodigal Son' in a search engine. In HTML, images are displayed with the help of the img element (or tag). This img element contains an attribute called title. The value entered for the title element shows up when a user places the mouse pointer on the image. Just move your mouse pointer on the picture of the Prodigal Son. Sometimes images don't show up on a web browser due to a slow internet connection or some other problem. The value in the alt tag shows up when the images are not displayed. This is very useful for users with disabilities and search engine spiders. Images having a smaller size load more quickly than images with a larger size. This is important if you have multiple images on your website or blog. Note: Blogger blogs have a 1 GB limit as all pictures uploaded go to Picasa a free Google photo service. So use images with smaller size. @Slow PC: Filenames are very important.